Not to be confused with the American white supremacist author and speaker Richard B. Spencer. Spencer, a self-proclaimed expert on radical Islam, has published a number of books on the subject including two New York Times bestsellers. 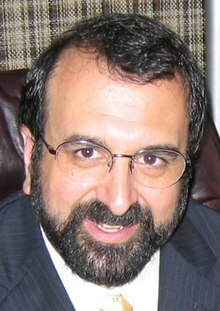 In 2003 he founded and has since directed Jihad Watch, a blog which he describes as containing "news of the international jihad, [and] commentary" which is dedicated to "bringing public attention to the role that jihad theology and ideology plays in the modern world, and to correcting popular misconceptions about the role of jihad and religion in modern-day conflicts". He has also co-founded the anti-Muslim group Stop Islamization of America (SIOA) and the Freedom Defense Initiative with blogger Pamela Geller, with whom he also co-authored a book, The Post-American Presidency: The Obama Administration's War on America. His viewpoints have been described as anti-Muslim. Spencer describes himself as "the “good” kind of Islamophobe." In 2013 the UK Home Office barred Spencer and Geller from travel to the UK for 3 to 5 years for "making statements that may foster hatred that might lead to inter-community violence". Spencer is a former member of the Melkite Greek Catholic Church. In a 2006 interview, Spencer stated that his grandparents were forced to emigrate from an area that is now part of Turkey because they were Christians. According to a 2010 interview in New York magazine, Spencer's father worked for the Voice of America during the Cold War, and in his younger days, Spencer himself worked at Revolution Books, a Maoist bookstore in New York City founded by Robert Avakian. Spencer received an M.A. in 1986 in religious studies from the University of North Carolina at Chapel Hill. His masters thesis was on Catholic history. He has said he has been studying Islamic theology, law, and history since 1980. He worked in think tanks for more than 20 years, and in 2002–2003 was an adjunct fellow with the Free Congress Foundation. Spencer named Paul Weyrich, also a Melkite Catholic, as a mentor of his writings on Islam. Spencer writes, "Paul Weyrich taught me a great deal, by word and by example – about how to deal both personally and professionally with the slanders and smears that are a daily aspect of this work." Spencer left the Catholic Church in 2016 and returned to the Greek Orthodox Church. Spencer does not believe that traditional Islam is "inherently terroristic" but says he can prove that "traditional Islam contains violent and supremacist elements", and that "its various schools unanimously teach warfare against and the subjugation of unbelievers". However, he rejects the notion that all Muslims are necessarily violent people. He has said that among moderate Muslims, "there are some who are genuinely trying to frame a theory and practice of Islam that will allow for peaceful coexistence with unbelievers as equals." Spencer co-founded Stop Islamization of America (SIOA) and the American Freedom Defense Initiative (AFDI) with Pamela Geller in 2010. Both organizations are designated as hate groups by the Anti-Defamation League and the Southern Poverty Law Center. In July 2011, Wired reported that two of Spencer’s books were listed in FBI training materials. Both The Truth About Muhammad and The Politically Incorrect Guide to Islam were recommended for agents hoping to better understand Islam. On December 20, 2006, the government of Pakistan announced a ban on Spencer's book, The Truth About Muhammad, citing "objectionable material" as the cause. Onward Muslim Soldiers was banned in Malaysia on July 12, 2007. In 2009, Spencer was asked to participate in an information session about Islam and Muslims designed for ethnic and multicultural librarians entitled "Perspectives on Islam: Beyond the Stereotyping", at the 2009 annual meeting of the American Library Association, which was sponsored by the ALA's Ethnic & Multicultural Information Exchange Round Table (EMIERT). After objections were raised by ALA members and the general public, the three other panelists withdrew in protest and the session was ultimately canceled. During Operation Protective Edge, Spencer was accused of spreading an anti-Palestinian misinformation video, originally published by Pamela Geller, by inaccurately claiming a video of an Egyptian die-in protest from Egyptian newspaper El Badil was a video of Hamas faking the number of casualties killed by Israel. Robert Spencer wrote “as Muhammad said, ‘War is deceit.’ And so here is more ‘Palestinian’ victimhood propaganda unmasked. Not that the international media and the world ‘human rights community’ will take any notice. Video thanks to Pamela Geller.” After El Badil had the video removed from Geller's YouTube account due to copyright infringement, El Badil wrote that Spencer and Geller's inability to distinguish a die-in protest from an Islamic funeral either makes them "incompetent to speak on Islam or they are professional liars." In an October 2010 news article, an investigative report by The Tennessean described Spencer as one of several individuals who "... cash in on spreading hate and fear about Islam." Tennessean investigation concluded "IRS filings from 2008 show that Robert Spencer earned $132,537 from the David Horowitz Freedom Center, and Horowitz pocketed over $400,000 for himself in just one year". Spencer was first invited to be a speaker at the Catholic Men’s Conference of the Roman Catholic Diocese of Worcester on March 16, 2013. The Bishop Robert Joseph McManus then decided to rescind the invitation. On April 13, 2017, Spencer spoke at the Truman State University despite protests and a petition against him. He was invited by the Young America's Foundation. On May 1, 2017, Spencer spoke at the University of Buffalo. There he was shouted down and heckled. On May 3, 2017, Spencer spoke at Gettysburg College. 375 alumni urged the college president Janet Morgan Riggs to cancel the speech, but the event went on as planned. Spencer said, "There is one kind of diversity that is not valued generally in an academic setting and that is intellectual diversity." On November 14, 2017, Spencer spoke at Stanford University. Many students walked out during the event. On June 26, 2013, Spencer and Pamela Geller were banned from entering the UK. They were due to speak at an English Defence League march in Woolwich, south London, where Drummer Lee Rigby was killed. Home Secretary Theresa May informed Spencer and Geller that their presence in the UK would "not be conducive to the public good". "It [Islam] is a religion or a belief system that mandates warfare against unbelievers for the purpose of establishing a societal model that is absolutely incompatible with Western society ... because of media and general government unwillingness to face the sources of Islamic terrorism these things remain largely unknown." The decision will stand for between three and five years. The ban followed a concerted campaign by the UK anti-extremism and civil rights organization Hope not Hate, which said it had collected 26,000 signatures for a petition to the Home Secretary. Spencer and Geller contested the ban, but in 2015 the British Court of Appeals dismissed the appeal, arguing that "this was a public order case where the police had advised that significant public disorder and serious violence might ensue from the proposed visit." The ban was criticised by Douglas Murray. He noted that Islamist hate preachers are still allowed to enter the UK. The History of Jihad: From Muhammad to ISIS. Bombardier Books. August 7, 2018. ISBN 9781682616598. OCLC 1046676281. Confessions of an Islamophobe. Bombardier Books. November 28, 2017. ISBN 978-1682614914. OCLC 1022710774. Not Peace But a Sword: The Great Chasm Between Christianity and Islam. Catholic Answers. March 25, 2013. ISBN 978-1938983283. OCLC 840646024. Pamela Geller; Robert Spencer (July 27, 2010). The Post-American Presidency: The Obama Administration's War on America. Threshold Editions. ISBN 978-1-4391-8930-6. The Complete Infidel's Guide to Free Speech (and Its Enemies). Regnery Press. July 24, 2017. p. 256. ISBN 978-1621576273. OCLC 993696636. The Complete Infidels' Guide to Iran. Regnery Press. July 11, 2016. p. 256. ISBN 978-1621575160. OCLC 952247204. The Complete Infidel's Guide to ISIS. Regnery Press. August 24, 2015. ISBN 978-1-62157-453-8. OCLC 916923210. The Complete Infidels' Guide to the Koran. Regnery Press. September 21, 2009. p. 260. ISBN 978-1-59698-104-1. OCLC 317454159. Did Muhammad Exist? : An Inquiry Into Islam's Obscure Origins. ISI Books. March 2012. ISBN 978-1-61017-061-1. OCLC 883649585. Stealth Jihad: How Radical Islam is Subverting America without Guns or Bombs. Regnery Press. October 28, 2008. ISBN 978-1-59698-556-8. OCLC 740862521. Religion of Peace? : Why Christianity Is and Islam Isn't. Regnery Publishing. 2007. ISBN 978-1-59698-515-5. OCLC 929251820. Inside Islam: A Guide for Catholics: 100 questions and answers. Ascension Press. 2003. p. 197. ISBN 978-0-9659228-5-2. Islam Unveiled: Disturbing Questions About the World's Fastest Growing Faith. Encounter Books. October 25, 2002. p. 202. ISBN 978-1-893554-58-0. OCLC 752326911. The Arab Winter Comes to America: The Truth about the War We're In. Regnery Publishing, Incorporated, An Eagle Publishing Company. 2014-04-14. ISBN 978-1-62157-204-6. OCLC 877883931. ^ Lee, Benjamin (4 September 2015). "A Day in the "Swamp": Understanding Discourse in the Online Counter-Jihad Nebula" (PDF). Democracy and Security. 11 (3): 248–274. doi:10.1080/17419166.2015.1067612. ^ "Meet The Extremists Who Lead Fox's Conversation About Islam". Media Matters. January 13, 2015. Archived from the original on 2017-02-11. Retrieved 2017-02-10. ^ "Anti-Muslim speakers still popular in law enforcement training". The Washington Post. March 12, 2014. Archived from the original on 2017-03-18. Retrieved 2017-09-10. ^ Deland, Mats (2014). In the Tracks of Breivik: Far Right Networks in Northern and Eastern Europe. Berlin Wien: Lit Verlag. p. 162. ISBN 978-3-643-90542-0. ^ a b c "Robert Spencer Jihad Watch, Director Q & A with Brian Lamb". CSpan. August 20, 2006. Archived from the original on 2014-11-09. Retrieved November 30, 2014. ^ "Why Jihad Watch?". Jihad Watch. Archived from the original on 2010-03-31. Retrieved June 17, 2011. ^ Jeffrey Kaplan; Heléne Lööw; Leena Malkki (2017). Lone Wolf and Autonomous Cell Terrorism. Taylor & Francis. p. 214. ISBN 978-1-317-53042-8. ^ "Anti-Muslim speakers still popular in law enforcement training". The Washington Post. 2014. ^ Shane, Scott (2011-08-03). "To Fight Radical Islam, U.S. Wants Muslim Allies". The New York Times. ISSN 0362-4331. Retrieved 2019-04-21. ^ "Iowa's congressional delegation responds to Trump immigration order". Des Moines Register. Retrieved 2019-04-21. ^ "The Case for Islamophobia". Frontpage Mag. 2017-12-06. Retrieved 2018-05-23. ^ "About Robert Spencer". Jihad Watch. Archived from the original on December 29, 2010. Retrieved October 29, 2010. ^ Spencer, Robert (October 26, 2010). "Pope must condemn demonizing of Israel". Spero News. Archived from the original on 2010-10-29. Retrieved 2010-10-29. ^ a b Mark Jacobson (August 22, 2010). "Muhammad Comes to Manhattan". New York. Archived from the original on 2010-08-26. Retrieved November 1, 2010. ^ "The monophysite in the mirror, by Robert Bruce Spencer". Davis Library Thesis, Religion, 1986. UNC-CH Libraries. 1986. Archived from the original on 2017-03-01. Retrieved 2013-03-20. ^ "Marines gather to honor, celebrate". Trib.com. 2005-10-26. Archived from the original on 2017-09-08. Retrieved 2010-11-01. ^ a b Robert Spencer (December 19, 2008). "A Tribute: Paul Weyrich Has Died". Catholic Online. Archived from the original on March 9, 2009. Retrieved December 16, 2010. ^ Jeffrey Rubin (October 25, 2018). "Robert Spencer and the Religion of Terror". Crisis Magazine. Archived from the original on 2018-10-25. Retrieved October 26, 2018. ^ a b "The Last Patriot: Worse than Spencer's books!". Jihad Watch. July 7, 2008. Archived from the original on 2009-01-05. Retrieved 2008-07-08. ^ Robert Spencer (January 14, 2006). "What is a moderate Muslim?". Jihad Watch. Archived from the original on 2008-10-14. Retrieved 2009-07-18. ^ "Backgrounder: Stop Islamization of America (SIOA)" Archived 2012-05-02 at the Wayback Machine. Extremism. Anti-Defamation League. March 25, 2011 [August 26, 2010]. Retrieved February 16, 2012. ^ Lach, Eric (March 1, 2011). "Pam Geller On 'Hate Group' Label: 'A Badge of Honor'". Talking Points Memo. Archived from the original on 2012-03-13. Retrieved 2012-02-17. ^ "Pamela Geller & Stop Islamization of America". Southern Poverty Law Center. Archived from the original on 2011-06-25. Retrieved 27 June 2011. ^ Steinback, Robert (Summer 2011). "Jihad Against Islam". Intelligence Report, Issue #142. Southern Poverty Law Center. Archived from the original on 2012-01-19. Retrieved June 27, 2011. ^ Ackerman, Spencer (July 27, 2011). "FBI 'Islam 101' Guide Depicted Muslims as 7th-Century Simpletons". Wired. Archived from the original on 2018-12-04. Retrieved 2018-11-21. ^ "Pakistan: Book Closed on Muhammad". 2007-01-09. Archived from the original on 2015-06-12. Retrieved 2015-04-19. ^ "Ministry Bans 14 Books". BERNAMA. 12 July 2007. Archived from the original on 3 March 2016. ^ Raya Kuzyk; Norman Oder (July 11, 2009). "ALA Conference 2009: Panelists Quit Session Featuring 'Islam Basher'". Library Journal. Archived from the original on 2011-12-24. Retrieved June 11, 2011. ^ "Anti-Muslim crusaders make millions spreading fear". October 24, 2010. Retrieved November 4, 2010. ^ "David Horowitz Freedom Center's IRS Form 990" (PDF). June 3, 2009. Retrieved April 24, 2011. ^ "Catholic speakers". Archived from the original on 2015-09-23. Retrieved 2015-04-20. ^ "Catholic Men's Conference opens ticket sales". The Catholic Free Press. 8 February 2013. Archived from the original on 2015-09-23. Retrieved 2015-04-20. ^ "Truman State grapples with controversial anti-Muslim speaker". St. Louis Post-Dispatch. Archived from the original on 2017-04-24. Retrieved 2017-05-03. ^ "No violence, but UB speaker greeted with tension, heckling". The Buffalo News. 2017-05-02. Archived from the original on 2017-05-02. Retrieved 2017-05-03. ^ "Open letter from 375 alums urges President Riggs to cancel Robert Spencer's speech". The Gettysburgian. May 1, 2017. Archived from the original on 2017-05-03. Retrieved 2017-05-03. ^ Pontz, Benjamin (May 3, 2017). "Robert Spencer's speech at Gettysburg College engages students in civil discourse". The Gettysburgian. Archived from the original on 2017-05-04. Retrieved 2017-05-04. ^ "Stanford Students Walk Out, Protest During Robert Spencer Speaking Event". NBC Bay Area. Archived from the original on 2017-11-17. Retrieved 2017-11-16. ^ "US bloggers banned from entering UK". BBC. June 26, 2013. Archived from the original on 2013-06-27. Retrieved June 27, 2013. ^ Rawlinson, Kevin (June 26, 2013). "Anti-Ground Zero Mosque campaigners Pamela Geller and Robert Spencer barred from entering Britain to speak at an EDL rally". The Independent. London. Archived from the original on 2013-06-27. Retrieved June 27, 2013. ^ The Speech that Got Robert Spencer Banned From the UK. YouTube. June 27, 2013. Archived from the original on 2017-02-02. Retrieved 2016-12-01. ^ "Anti-Muslim pair banned from UK". Daily Express. UK. June 26, 2013. Retrieved June 27, 2013. ^ Lowles, Nick. "Geller and Spencer Banned". Hope not Hate. Archived from the original on 2013-06-30. Retrieved June 27, 2013. ^ "Geller & Anor, R (on the application of) v The Secretary of State for the Home Department  EWCA Civ 45 (05 February 2015)". British and Irish Legal Information Institute. Retrieved October 31, 2017. ^ English, Rosalind (February 15, 2015). "Critics of Islam prevented from entering UK to attend Lee Rigby rally". UK Human Rights Blog. 1 Crown Office Row. Retrieved October 31, 2017. ^ "A gross double standard over hate speech". The Spectator. UK. June 27, 2013. Archived from the original on 2016-11-14. Retrieved February 8, 2017. This page was last edited on 21 April 2019, at 20:31 (UTC).